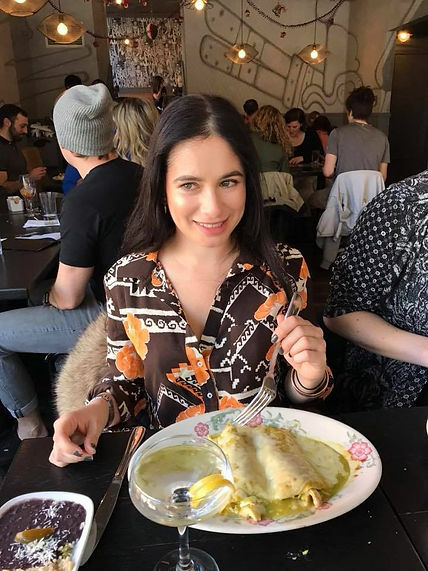 The latest fashionplate features the gorgeous Tasch Natalie blouse at La Contenta Oeste in the West Village. Met some friends here for a brunch to catch up and enjoy the finally spring weather. I made a res so we were seated right away. They have $8 brunch cocktails yay! I had a Mexican Coffee as did my friend’s hubby. She had a marg and my other friend had a martini. Drinks of all types going down. We then got guac to start. I was uber sad they wouldn’t make their famous nachos which I love at the les location. I guess I’ll have to make my way back for hh I guess so I can have those banging nachos again. Then we ordered another rounds of margs because hey it’s Saturday. I got the enchiladas suizas which were delish. One got the carne asada tacos which he loved. The other two both got the breakfast burrito which they also loved. More drinks turned into a full daytime drinking affair. I still love this spot EVEN though they wouldn’t make my nachos. Lol. This is a come as you are Mexican joint but I glammed it up a little the Tasch Natalie blouse. See how I styled this fashionplate and all the meal deets below. Check out the latest fashionplate at Augustine in the gorgeous Beekman Hotel. I met a friend here for brunch on a blustery Sunday and it was still packed so we grabbed seats at the bar. The bartender was amazing and friendly and knowledgeable. We started with some bloodies and much needed coffee. Then we started with the cheese souffle, all I can say is OMG. Amazing and decadent, I really wish more restaurants had cheese souffles on the menu. I then ordered a Girl in the Park which was a great cocktail I got Avocado and crab salad and my friend got the steak frites which I definitely ate some of. Everything was amazing and it was a great lesuirely Sunday afternoon well spent. There are so many interesting regulars that come here, dress to impress definitely a fun spot, I’ll be back. See how I styled this fashionplate below. This week’s fashionplate keeps us warm during brunch with our Lana jogger pants at Shay & Ivy in my hood. One a cold Saturday I was meeting my family for brunch and decided to pick someplace close to home. I bundled up even though it was a quick walk. My cousin and me got there before my parents, so we ordered some coffee and avocado toast and caught up while we waited. The avocado toast was super yummy and had pomegranate seeds on top. When my parents showed up I needed a bloody mary which was good. I got the burger which was great and I also loved the fries, crispy and thick. I also sampled the chicken panini which was good and the virgina benedict which was really good and made on a biscuit instead. We had a great time catching up. It was pretty empty but hopefully as it gets warmer , more people will come for the outdoor concert. See all the deets for this fashionplate below. This week’s fashionplate takes place at Speedy Romeo’s in LES and rocked our Taylor buffalo check flannel shirt. I met a gf here for brunch on a surprisingly warm weekend. Of course we started with Bloody Mary’s, mine extra spicy. We then decided to split two things so we could try a pizza and something else. We got the Ritz pizza, which features taylor ham, an egg, plenty of cheese and tabasco, we all know I love my hot sauce. This was delish. We also got the baked eggs that had a delish tomato sauce and lots of cheese plus crusty butter bread to dip. Both of these dishes were yummy and we left brunch having to call our asses an uber. Fatgirls fo life. There weren’t a ton of people here but we had a late brunch for a non party brunch around 2:30 or so. See how I styled our Taylor shirt for this fashionplate below. 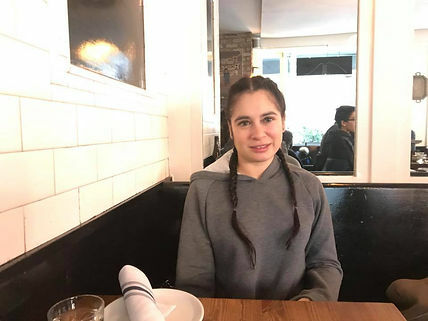 The latest fashionplate takes place at Sons and Daughters a fun spot in Meatpacking under the Highline. Went for brunch with a friend to catch up recently and thought our Taylor buffalo plaid flannel tunic was the perfect in between layer for the finicky fall weather. We opted for the aycd option for brunch as if you have 2 drinks you might as well. I started with their version of a bloody which was tasty although I only really can have one or two bloodies. I then switched to the hooked on a feeling which my friend got which was quite good. I got the SD burger which was tasty and the fries were crispy and good too. My friend got the veggie frittata which was also yummy. There were mostly couples and some brunch dates, mostly young trendy peeps. I will definitely be back for happy hour or dinner. Check out how I styled this fashionplate below. One of my favorite weekend activities has to be a leisurely brunch with my girls, all the more better when it’s aycd. So I knew I had to get down to the East Village/Alphabet City asap for a fun girly catch up brunch at Pardon My French for a fashionplate. I was the first to arrive somehow and the waiters couldn’t be sweeter and sat me at a table anyway and made sure the bloodies kept coming which were delish. They also have a cute outdoor garden. I decided to wear our new Sophia cami and make it a little fun and daytime approbs. Some of the girls got mimosas instead of bloodies which they liked as well and my one friend got straight champagne since she’s allergic to citrus. I got the Croque Monsiuer and 2 of my friends got the croque madame which we all loved, so delish. A friend also got the baked eggs which she seemed to like and one friend got the eggs Benedict. Now on to the fashion part of the fashionplate. The crowd was very downtown hipster save for one couple with a baby. Everyone was mostly well dressed, festival fashion or all black everything. The waiters were very french, sweet and attractive. Definitely a spot to check out. Check out the full OOTD deets below.